Light weight, function and the best merino wool: With Ortovox's new 120 Comp Light Short Sleeve for men, the naked sheep is ready for new personal bests! To follow the award-winning 230 Merino Competition, They have developed Ortovox's 120 Merino Competition line for high-action sports in both summer and winter. Consisting of a high proportion of merino wool, this line is now even lighter! What makes Ortovox's 120 Comp Light Short Sleeve for men so special is that it is produced using an almost entirely seamless circular knitting technique, so that different material strengths can be used in different zones. A fine ribbed structure made from 120 g/m² Merino gives this short, functional shirt elasticity for maximum freedom of movement, while a particularly breathable mesh structure ensures optimum air circulation in the areas of the body that generate the most heat. This body mapping technique, in which different knit structures are used in certain zones, ensures maximum ventilation. What’s more, thanks to its close fit, Ortovox's 120 Comp Light Short Sleeve for men is very elastic, highly breathable and quick drying, and yet still durable and long lasting. And the gentle merino fibers with a diameter of 16.5 microns feel as comfortable and soft as a second skin. The positive features of the wool fibers come into their own in this light functional underwear, because merino wool is naturally moisture and temperature regulating and neutralizes nasty odors. And thanks to the cool 3-color design, the Naked Sheep is always stylish. And it’s all “Made in Europe”! 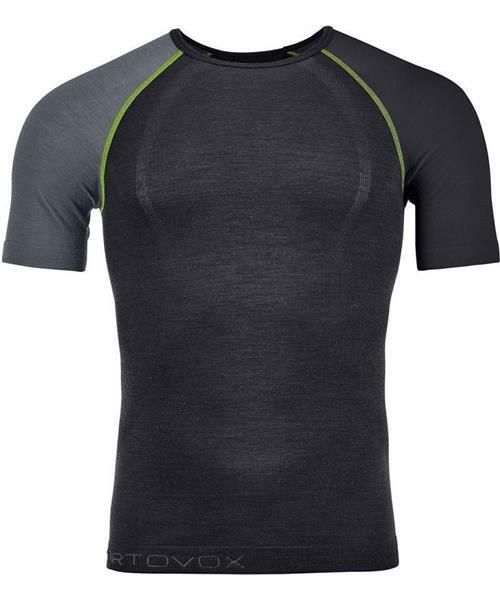 Experience pure lightness with Ortovox's 120 Comp Light Short Sleeve for men! Whether on a ski Ortovox's in winter or an alpine Ortovox's in summer, the way to Ortovox's personal top performance is wide open. Since 1995, merino wool has been an integral component of Ortovox's mountainwear. Ortovox's merino wool comes from selected farms that comply with Ortovox's own wool standard: the Ortovox's Wool Promise. Ortovox obtains its virgin wool from certified and ethical sheep farms. These farms are regularly monitored within the framework of the OWP. The wool is naturally 100% ecological and therefore super sustainable. Thanks to the small-diameter fibers in its fine woolen threads, merino wool feels extremely soft and comfortable on the skin. In addition to comfort, merino wool also provides an ideal personal body climate by regulating both moisture and temperature. It is also easy to care for and, thanks to its antibacterial effect, odor neutralizing.